In these examples it assumed that there are two nodes, LOCAL and REMOTE. All of the commands are entered at the local node, and can be interactive commands or commands within a batch command procedure. In the BacPac client/server architecture, the node on which the BacPac command is entered becomes the client, and the other node becomes the server. In the current BacPac implementation, file compression is performed on the computer which is "closest" to the disk which is being saved. 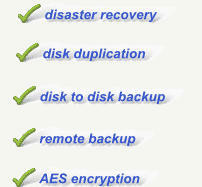 On restore operations, file expansion is performed on the computer which is “closest” to the disk being restored. Remote Save Examples Save a directory on a local disk to a saveset on a remote disk. Save a directory on a remote disk to a saveset on a local disk. Image save of a local disk to a saveset on a remote disk. Image save of a remote disk to a saveset on a local disk. Image save of a local disk to a remote tape drive. The local tape drive should be loaded with an initialized tape, and can be mounted or not mounted. If the tape is not mounted, BacPac will mount the tape. When the save is completed, the tape will be left positioned at the end of the pacset. If additional pacsets are to be added to the tape, omit the /REWIND qualifier after the first save. Remote Restore Examples Restore a directory from a saveset on a remote disk to a local disk. Restore a directory from a saveset on a local disk to a remote disk. Image restore of a local disk from a saveset on a remote disk. Image restore of a remote disk from a saveset on a local disk. Image restore of a local disk from a saveset on a remote tape. The remote tape drive should be loaded with the appropriate tape, but not mounted. The BacPac server will mount the tape. When the restore is completed, the BacPac server will dismount the tape /nounload. Image restore of a remote disk from a saveset on a local tape. The local tape drive should be loaded with the appropriate tape, and can be mounted or not mounted. If the tape is not mounted, BacPac will mount the tape. When the restore is completed, the tape will be left positioned at the end of the pacset. If additional pacsets are to be restored from the tape, omit the /REWIND qualifier after the first restore.